To order Wizard #200 GOLD from a comic shop near you click here. From Wizard Entertainment. A celebration so big, it needs two issues!!! Since Wizard’s launch in July 1991, it’s never been a more exciting time to be a fan of comics and pop culture, and we’ve been on the front lines through it all. Comic book movies have become the standard summer popcorn blockbusters. Comic book collections can be seen on the shelves of every major bookseller. Major celebrities have professed their love of comics and took on the role of ambassador to the medium. 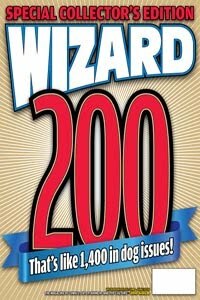 The first of two issues, the Wizard # 200 Gold Edition gets the party started with: the 200 Greatest Comics in Wizard’s History; the 50 events to rock comics history; the 10 Most Controversial People in Comics; in-depth Q&As with the founders of Image Comics; the Ultimate Geek Quiz; thoughts from top artists on what their first Wizard cover meant to them at that point in their careers; the 20 most collectible comics produced from 1991 to today; and much more! Plus: 20 pages of the best artwork to ever grace our pages, fresh with behind-the-scenes artist anecdotes, and the rollercoaster evolution of Wolverine in an original art piece by Kevin Maguire!